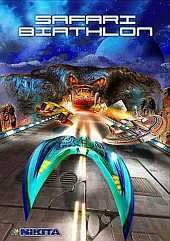 The game is a futuristic race with turbocars. The action takes place on several planets, each of those planets has three racetracks. On the first planet amateur competitions are held, on the second, professional competitions, and on the third, competitions for the title of the Champion of the Universe. There are 14 different models of turbocars in the game - sandcars, gliders, marsh buggies and snow cars with maximum speeds of up to 500 km per hour. Each car is equipped with an onboard weapons system, which allows you to hit opponents' cars from a distance.The game will be well liked by enthusiasts of unearthly scenery, terrific speeds, all-sweeping gunfire and smashing soundtracks.